The discovery of the dynamic component of topgraphy arising from the mantle has been a major breakthrough in geology. The consquences of mantle flow on surface topography and deformation has been recognized in many geodynamic contexts, such as subduction zones. However, the amplitude and wavelength of dynamic topography depends on lots of parameters. I performed analog experiments in order to highlight the effect of the downgoing slab on upper plate topography and quantify it. We compare the results of two types of experiments: one simulates the shortening between two continental plates, the other type is composed of an oceanic plate subducting below a continental one. A weak zone helps localize the deformation at the center of the model. The topography evolution is recorded during the experiment with a scanner laser. On the left is shown the surface topography for the subduction experiment after 10 minutes (equivalent to 19 Ma). We can compare the topography of the upper plate with the shortening experiment for two similar amounts of shortening. In theory, the plates having the same density and thickness, their elevation should be identical. Any difference between the two models arises from the presence of the slab and active subduction. 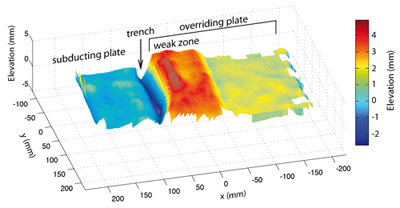 We find a difference in elevation equivalent to a range comprised between 500 and 800 m. Further work with a more accurate quantification of the forces at work will provide clarifications on the way the dynamic component is acting in subduction zones. Bajolet F., Faccenna C., Funiciello F. Dynamic topography in subduction zones: insights from analog modeling, in preparation. Delamination has often been invoked to explain regional uplift (usually associated with alkaline volcanism) either by "peeling" of the lithospheric mantle and in some case a part of the lower crust, or by viscous dripping (convective removal). Various geodynamic contexts such as high plateaus near a plate boundary (Tibet, Andes, Anatolia...) or smaller-scale intracontinental plateaux (Sierra Nevada California, Colorado plateau...) could be places where delamination occurs(ed). The analog model's set-up is built to test the "peeling model" with 3 lithospheric layers (upper crust, lower crust, lithospheric mantle) lying on an asthenospheric-like material. Record of topography and mantle flow during the experiment allow us to test the influence of several parameters (density, viscosity, geometry) on the dynamics of delamination and related topographic response (see lab section). Areas of dynamic uplift and subsidence can be traced as they move across the plate following delamination's motion and mantle flow, as well as isostatic uplift of the delaminated area. A semi-quantitative study allows us to determine empirically two parameters: (1) an initiation parameter that constrains the propensity of the delamination to occur and correlates with the duration of the first stage, (2) a buoyancy parameter characterizing the delamination velocity during late stages and therefore its propensity to cease. Finally, we point out similarities and differences with the Sierra Nevada (California, USA) in terms of topography, deformation and timing of delamination. Bajolet F., Galeano J., Negredo A.M., Funiciello F., Moroni M., Faccenna C., 2012. Continental delamination: Insights from laboratory models, Geochemestry Geophysic Geosystems, 13, Q02009, doi:10.1029/2011GC003896. In some mountain belts like the Pyrenees, we observe outcrops of lherzolites (peridotites) in carbonates and marbles sometimes brecciated, far from the classical ophiolites context where such outcrops are well explained. The peridotites are deep mantle rocks wheareas the carbonates mainly form on the continental shelf. Before the Pyrenees built up during the Tertiary, the region undergone extension with the opening of a basin then formation of passive margins. Theses observations raised questions about the mechanisms that bring the peridotites in their current geological situation: were they exhumed by sedimentary and/or tectonic processes, during extension or during compression? The detailed mapping of a km-scale site where peridotites outcrop on the footwall of the North Pyrenean Fault (the main frontal thrust of the Pyrenees) showed that they are organized in plurimetric to plurihectometric lenses elongated in the EW direction. The amount of alteration is very variable, lenses being constituted by fresh peridotite (in orange on the photo on the right) where the magmatic foliation is still visible to totally serpentinized peridotite (in green on the photo). Contacts are often characterized by breccias with both marble/carbonate and peridotite clasts. Some breccias contain peridotite clasts showing various degree of serpentinisation, hence coming from different sources, and some breccias are organized with layering. The presence of organized breccias implies that they were formed by sedimentary deposition on the seafloor of a passive margin where lithospheric mantle was exposed, before tectonic inversion. That do not exclude that other breccias formed by tectonic processes during exhumation of this fragment of passive margin during orogenesis. This study provide strong field constraints and contribute to reevaluate our view of extension and inversion mechanisms. de Saint-Blanquat M., Bajolet F., Clerc C., Grand'Homme A., Proietti A., Zanti, M., Boutin A., Lagabrielle Y., Labaume P. Cretaceous mantle exhumation in the central Pyrenees: New constraints from the peridotites in eastern Ariege (North Pyrenean Zone, France), CR Geosciences, 348(3-4), 268-278, doi:10.1016/j.crte.2015.12.003.